Harrogate and the surrounding areas are a fantastic place for bringing up children and there is plenty going on. As well as their usual sessions, Boogie Babes are joining the residents of 4 Dementia care homes! Are you looking for an afternoon activity for your little ones? Then come and be part of something special: Come and wiggle, dance, sing, shake pom-poms, flip the parachute, and pop the bubbles with the residents of one of four Dementia care units. After reading about the positive impact brought about by mixing these two very different age groups and the benefits for both, I decided Boogie Babes would be perfect! Refreshments included at the end of the class. CJMAA are a full-time Martial Arts Academy based in Knaresborough. With classes running 6 days a week for both children & adults, Chris and his team of instructors have been teaching in the area, full-time, for nearly 15 years. 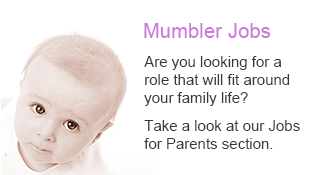 In 2013, CJMAA were themselves winner of a Mumbler award in recognition of their popular children’s classes. At CJMAA their goal is to make Martial Arts accessible to all with class types ranging from pre-school parent & child classes to adult kickboxing and ladies only sessions. Home to multiple World, European and National champions, CJMAA is also a great place for students who wish to take their training to the next level. Their center based on Park Avenue, just of Boroughbridge Road, is custom fitted with all the required safety equipment and holds a 5 star CMAA Kite Mark rating. Enjoy-a-Ball is a multi sports coaching programme for girls and boys aged between three and nine. All lessons are taught in a caring, positive, fun-filled environment and there are never more than 12 children in a class. Our objective is to make children’s first experiences in a sports coaching environment happy and memorable. Ahead of our new term starting in January 2019, Tennis Tots is running a short 5-week course completely FREE of charge! We’re looking for children aged between 2-4 years to join us on a Thursday morning at Westcliffe Hall (nr Cold Bath Road). The course is completely free and will run from this Thursday 8th November until Thursday 6th December. Started in Harrogate in 2009, Tennis Tots now has franchises around the UK. We are in the process of introducing new games and activities into the programme and would like to test these out in a live class environment. ⭐️ Tennis Tots classes also require adult participation as children work through the activities on a 1-1 basis – we can support twins but if younger children are present then we suggest bringing another adult to help out. ⭐️ Children to wear suitable clothes and shoes that enable children to run freely and safely.
? To confirm your place email harrogate@tennis-tots.co.uk today and like our page to stay up to date on course details. Places will be allocated on a first come first served basis!
? Please also email harrogate@tennis-tots.co.uk if you wish to register for our January classes. 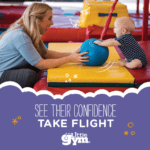 Our structured pre-school sessions are fun and energetic sessions designed to help little ones find their confidence in a class setting whilst exploring the equipment. Our fun sessions help improve agility, balance, coordination, and other fundamental movement skills. For those who want to explore and play on their own terms, we have our drop in sessions which run several times during the week – these sessions are also great as there is no booking required just turn up on the day! Hartbeeps is a music and movement class for babies, toddlers and pre-school children. A magical, musical soundtrack comes to life through puppetry, props and fun allowing your child to be at the centre of their own adventure and creates a sound journey down the rabbit hole into a childhood world of imagination. Happy House: Family class for toddlers, suitable for their younger and older siblings. 11:00am Happy House: Family class for toddlers, suitable for their younger and older siblings. 9:30am Happy House: Family class for toddlers, suitable for their younger and older siblings. 10:30am Baby Beeps: Sitting to toddling. 11:45am Baby Bells: Newborn to sitting. 11:30am Baby Bells: Newborn to sitting. 9.30 am Happy House: Family class for toddlers, suitable for their younger and older siblings. 10.30am Baby Beeps: sitting to toddling. 11.30am Baby Bells: newborn to sitting. 1:15pm Baby Beeps: Sitting to toddling. 2:15pm Baby Bells: newborn to sitting. 10am Happy House: Family class for toddlers, suitable for their younger and older siblings. 1 session rates and fun pass rates available. We also do parties for 1-4 year olds 🙂 We will make your little’s birthday magical! Please ‘like’ our page for updates about our sessions. We would love to see you at Hartbeeps soon. We have some fantastic cooking activities for your children to do starting with February half term till August 2019. Join us at Harrogate Ladies College on Wednesday 27th February: A fun holiday class full of magic sparkles! Create, make & decorate cupcakes & biscuits to a Unicorn/Spaceship theme. Then in the afternoon learn how to make Fresh Pasta. Very messy! For children aged 2 upwards, join a Cook ‘n’ Book session of “Little Red Hen Makes Pizza” at Kidzplay Harrogate on Thursday at 10am. Stuck for After School activities then visit Kidzplay Harrogate on Monday starting 4th March with KiddyCooks 6wk Kitchen Science programme. We look forward to seeing everyone this year at Springtime Live & Great Yorkshire Show. Sometimes a little calmness is all we need to rebalance our hectic lives. In Go Calm the Flow down a slower alignment centred class will still link the breath to the movement and poses to stretch your body while calming and restoring. Each class will include centring and a deep relaxation to seal in all the benefits. You will leave feeling relaxed and rejuvenated. Suitable for all abilities including pregnancy (after first trimester). We have over 40 different classes on offer each week in Yoga, Pilates, Hot Yoga, Beginners Yoga, Aerial Yoga, Mediation, Relaxation, Kundalini Yoga. We also run regular workshops, courses and retreats for all abilities as well as Parent & Pre-schooler yoga and Teen Yoga. 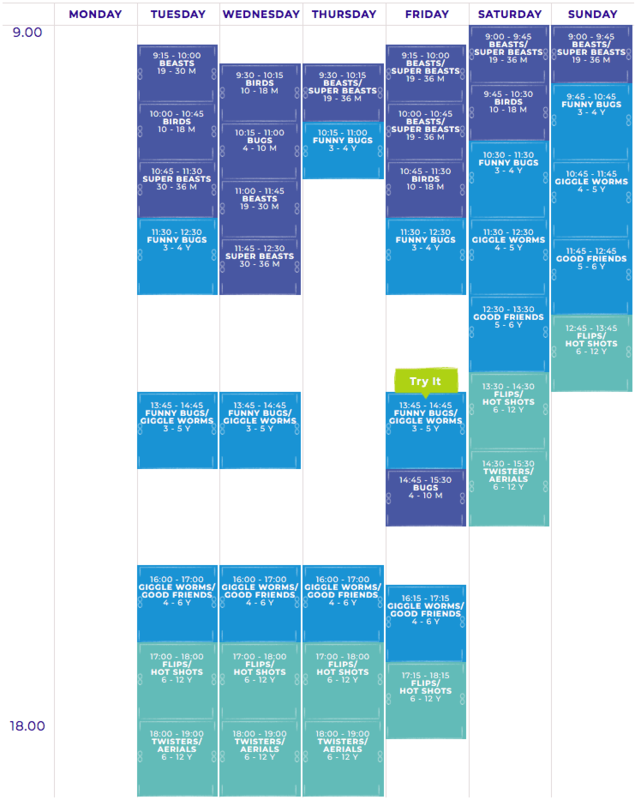 Our flexible class pass system allows you to attend any class on the timetable so you can fit your classes around your busy lives. Introductory offers for new clients. Easy hassle free booking online or via our app. Whether you are new to yoga or a keen enthusiast, we have a class for you. 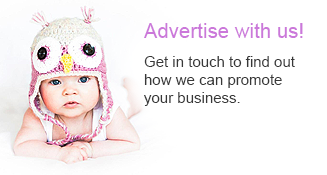 Do you want the best start for your little one, no matter what their own individual needs are? Do you want to watch them grow and develop fantastic new skills whilst having the most amazing musical fun? Welcome to Rhythm Time! Fun, quality classes that help develop a child’s confidence, creativity, listening skills, language, numeracy and co-ordination. Courses are specially written by a music teacher and created to enhance every child’s development. A holistic, musical and multi-sensory approach to baby development, where we do lots of activities which encourage brain development through eye-tracking, listening and experimenting with sound and textures. We have fun with bubbles, hoops, mirrors as well as learning listening skills with Ratatat, our Rhythm Time rabbit! Every baby and toddler is an individual with great potential. We’ll teach you how to make music fun for your child, and show you how you can help to unlock their potential by singing and making music together. We have classes in Harrogate and Wetherby, as well as surrounding areas. Highfield Pre-School, located on Duchy Road in Harrogate, is launching a brand new parent and toddler group for 0-2 year olds. The sessions, called “Tea and Toys”, will run on Thursday afternoons from 2pm-3pm and are designed to give parents and children aged 0-2 years an opportunity to socialise and play in Highfield’s pre-school and private gardens. The Tea and Toys sessions are free to attend, refreshments are included and everyone is welcome. Sessions will run weekly from Thursday 26th April during Highfield Pre-School term time only. Please call 01423 537045 to find out more, or just pop along to Highfield Pre-School on Duchy Road on Thursdays at 2pm. (Off street parking available). “Tennis Tots is a great activity for improving your child’s confidence and hand-eye co-ordination. Developed by former professional tennis player and respected coach Matthew McTurk, the Tennis Tots programme provides a perfect introduction to tennis for children aged 2-7 years. Working through the Tennis Tots programme of fun and varied games with you as their helper, your child will learn how to throw, catch and strike the ball with confidence. Movement skills developed by your child at Tennis Tots will compliment other activities as they grow and explore their interests. Tennis is a great sport to play at any age. The combination of movements needed to turn, lunge, crouch and swing in order to hit the ball mean that you get a full body workout while you play. To play Tennis successfully takes balance, agility and co-ordination as well as speed, flexibility and endurance. At Tennis Tots, we’ve broken down these key skills into fun activities and games for you and your child to enjoy in class. With a brand new coach and lots of new games and activities – we can’t wait to get started! The Fern Club – STEAM+M children’s programme. The Fern Club is unlike any other STEAM (Science, technology, engineering, art and maths) programme as our main focus throughout the class is movement; STEAM+M. Children are free to move from activity to activity as they please, experiencing STEAM inspired skills as they go. For children aged 18 months -7 years we specialise in promoting a love for learning. Aiming to take away the pressures of formal education and encourage the child’s natural inquisitive playful self. The Fern Club follows a curriculum of classes; specifically tailored for children, focusing on a different weekly theme. During the class each parent and child will experience skills and activities together. What’s most important though is that children love to move, so our classes have a big emphasis on motor skill development. By no means are we looking for “finished products”, we encourage children to explore and take the lead. For you the parents we give you the tools to help your child’s inquisitive mind flourish and to spot the benefits and learning in action. As a member of The Fern Club, you the parent will be actively involved as your child experiences new and exciting opportunities. You’ll be right there with them as they achieve new skills and master new levels of thinking. Your job is to guide your child through the activities on offer. This could be lending a helping hand, trying something together, participating beside your child or simply standing back and letting them figure it out themselves. There will be a whole range of activities on offer, some will need your assistance, others will simply need you to watch and marvel at your little one discover something new. The only thing we ask of you is that you get involved and dedicate 1-unhurried-hour to your child. There are 3 locations in the Harrogate area on Monday, Wednesday and Thursdays. Duchy Road, The Green Hut and Calcutt. Parents are to stay with their child throughout the duration of the class to experience the class together. Siblings are welcome and discounts are available to those with more than 1 child between 18 months -7 years. Classes are booked termly with all details on the website. Places are limited so book early to avoid disappointment. 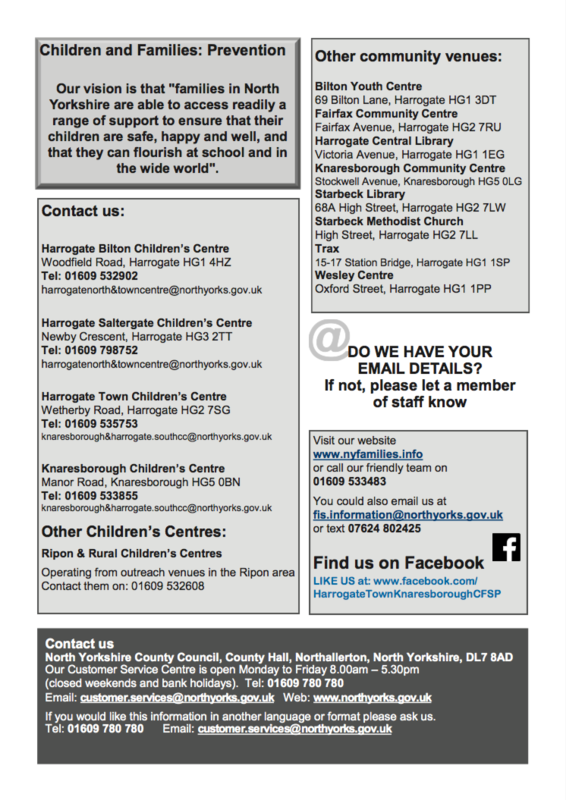 Harrogate Children’s Centre Program for low cost and no cost groups and sessions. 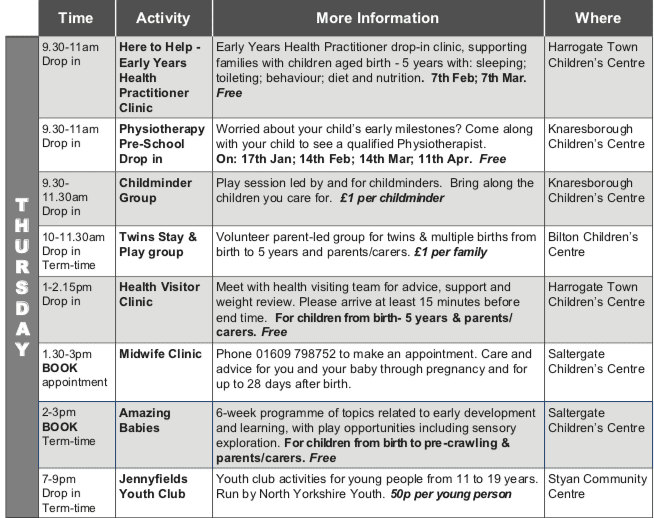 What is on for families in Harrogate? Timetanle for January- March 2019. Children & Families: Prevention. Harrogate & Knaresborough Areas. Eleanor runs award winning Toddler Sense classes in Wetherby and Harrogate. Toddler Sense offers children aged 13 months to 5 years the opportunity to explore a new play space each week; every week is themed differently – we might be flying on a rocket one week, digging for fossils the next, then discovering the jungle or being superheroes! Every class has been carefully planned to support children’s learning and development in line with the Early Years Foundation Stage; but they don’t know that, they’re too busy having fun!! Structured activities go hand in hand with the opportunity to play and discover. Each class starts with exploratory play, a great way of settling children in and allowing them to burn off some energy on the soft play, bouncy castles, balancing beams, pop up tents and tunnels. We have a huge range of equipment and resources; the children can’t wait to see what is set out each week! A 20-25 minute activity session follows, rich in sensory exploration, much loved songs, dance and creativity! 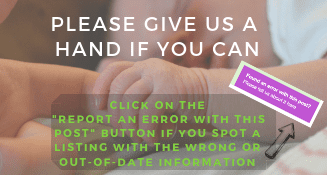 If you are looking for exciting activities which will be great fun for both you and your little one, please book on the home page or call Eleanor on 07771 982412 or email harrogate@toddlersense.co.uk. Want to try Toddler Sense for the first time? Come and see how the classes change each week! DID YOU KNOW THAT WE ALSO DO SPECTACULAR BIRTHDAY PARTIES! Please contact us for prices, availability and more information. 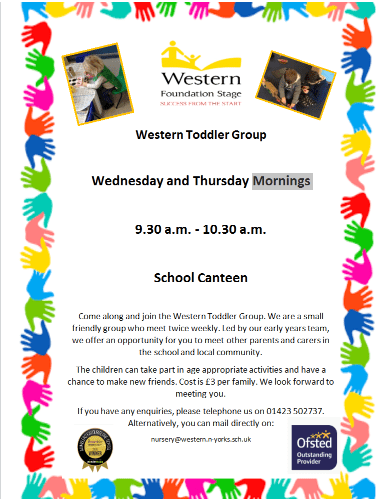 Welcome to Western Toddlers Group! We meet on Wednesday and Thursday mornings, 09.30 to 10.30 a.m. (term time only). Please find us in the school canteen across the back the playground. You may leave your pushchairs under the pergola and meet in the rear playground under the canopy. We’re a small, friendly group with toys and playmats for babies, different play and art activities each week for toddlers, refreshments and a sing song and/or story to finish, all for a small charge of £3 per family. We would be very happy to welcome you to our group! Aquababes sessions, Starbeck Swimming Pool on Spa Lane, Starbeck. Thursdays 9.45-10.45am (times may vary slightly during school hols). £1 per family to include drink and refreshment. We have a wide variety of toys that are rotated on a regular basis as well as a focused activity each week could be craft, messy play or baking. Every Thursday morning during term time-10.00am to 11.30am. All ages welcome up to school age with an accompanying parent or guardian! £3 entry fee- Tea, coffee and biscuits included. Friendly group for parents/grandparents/carers with babies and pre-school children. The baby and toddler group meet every Thursday (term time) from 9:15am until 11:30pm in the Hampsthwaite Memorial Hall, Hollins Lane, HG3 2EJ. Cheerleading is an energetic and fun way to keep fit and make new friends. Why not give it a try? The team meet on Thursdays at Jennyfield Styan Centre, and are currently looking for new members. You don’t need any experience, just lots of enthusiasm and be between 7 and 18 years old. The Karate Dojo Ripon offers karate classes for 4/5 year olds (Karate Tigers) & children/adults aged 6+. Free 2 week trial. Classes are taught by Sensei Ady Gray, 6th Dan. Central Ripon location. Discipline – Fun – Fitness – Confidence. 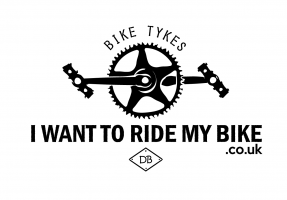 Contact us now on 07972 227772 to book your free trial. 50p donation for a drink and biscuit for mum and children. It’s run by two lovely ladies from the church. Very friendly and welcoming. A new group at Fairfax Community Centre called Messy Little Monsters. It’s a messy play group for Parents and children under 5. A chance to enjoy the fun of painting, baking, and arts and crafts without the stress of doing it at home or the clearing up!! Thursday mornings (during term time) 9.15am – 10.30am £2.00 per child. 1.30-2.30pm Exciting play activities for parents and children held at Pennypot Community Centre. £4 per child / £5 with siblings. First class FREE & if you mention Harrogate MUMBLER when booking you will also receive a 20% discount on your first half termly fee! Parent and toddler group in Starbeck for families affected by Autism, Asperger’s, learning difficulties & other additional needs. Come along and meet other families, make new friends, and share experiences. Other younger children from families also welcome – it’s about bringing parents together as well as the children playing together. £1 per adult – refreshments provided. The Yorkshire Academy of Film & Television Acting develops confidence, inspires creativity and nurtures passion to improve the performance of our students as actors. Fun acting classes for children and teens (and adults) of all ages and abilities. Monday evenings Harrogate Grammar School, Arthurs Avenue, Harrogate, HG2 0DZ.